Stop by the Cultural Corridor sites of Charlevoix Public Library, Charlevoix Historical Society, and Charlevoix Circle of Arts between 1:00-4:00 pm for FREE activities. Take a horse drawn carriage ride to and from these places and downtown’s East Park, where there will be festivities throughout the day, including a town wide groundhog scavenger hunt. • At the Charlevoix Public Library, families can enjoy storytime at the top of each hour starting at 1pm, 2pm, and 3pm. Drop in anytime between 1-4pm in the youth department to partake in S.T.E.A.M Station activities to measure their shadow, play a scientific “Marmots of the World” game, and make a puppet craft to tell their own groundhog story. The groundhog logo scavenger hunt is happening in the Youth Department. • To learn more about Groundhog Day and why this little marmot has become so famous, stop by the Charlevoix Historical Society at 103 State Street on the half hour for a special history lesson at 1:30pm, 2:30pm or 3:30pm. Take a selfie with “Smokey Joe” the groundhog. The groundhog logo scavenger hunt continues in the museum. • Visit the Charlevoix Circle of Arts anytime between 1-4pm to be inspired by the traveling exhibit of children’s illustrations from Central Michigan University in the gallery. Learn how to draw your own groundhog-inspired illustrations. Participate in the groundhog logo scavenger hunt here too. • Festivities in downtown Charlevoix and East Park are happening throughout the day. At each location Children can pick up/drop off a scavenger hunt form that contains questions about groundhogs. 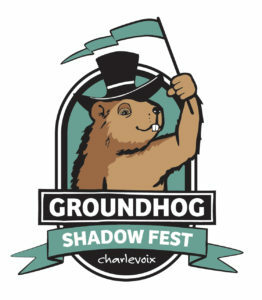 Cultural Corridor sites and East Park will each have two Shadow Fest groundhog logos that contain the scavenger hunt answers. Children who complete the form with the correct answers can turn in their submissions at any location to receive a prize! June 19, 2017– Charlevoix, Michigan – Three organizations in downtown Charlevoix have created a new area designated as the Charlevoix Cultural Corridor. The Charlevoix Public Library, Charlevoix Circle of Arts and Charlevoix Historical Society Museum have long been centers of cultural programming in the city, each offering distinct, yet complementary exhibits, events and programs to the general public as well as their members. With the creation of The Cultural Corridor, the three organizations are connecting their visions with a common goal of becoming a central destination for cultural activity in Charlevoix. Throughout the year, the organizations will collaborate on combined events or themes in hopes of providing visitors and locals with bountiful cultural experiences. The Cultural Corridor extends along Clinton Street, where the library and arts center are located, and also includes State Street, where the historical society is situated. The organizations began discussing the idea many months ago, as they each sought ways to highlight the cultural offerings in this part of downtown Charlevoix—an area that may sometimes be overlooked by visitors who stick to the main thoroughfare of Bridge Street. The designation was approved by City Council this past winter and the organizations are planning to kick off the new collaboration this summer. Charlevoix Circle of Arts at 231-547-3554.